Trial Updates ... recruiting completed for the current ERT Clinical Trial. Shire historical information - historical development updates, trials, etc. Interim data from the SHP611 (the new product name for Shire's ERT) Clinical Trial is showing some good results. The primary trial outcome is safety and so far SHP611 was safe and well tolerated at all doses. The secondary and exploratory endpoints focused on efficacy and include decline in motor function as defined by change in baseline Gross Motor Function Measure (GMFM-88). Interim data for the first 18 patients showed some decline in the GMFM-88 score across all doses, with the 100mg dose showing a slower decline over the 40 week study period compared to the other two treatment groups, most notably for those patients with GMFM-88 > 40-50 at baseline. Analysis of other exploratory efficacy measures is also encouraging. The HGT-1110 multi-center trial has been fully recruited. The trial lasts 40-weeks so the last patient should complete their primary end point in March 2015 or thereabouts. Allowing 3-4 months for data analysis and review, there might be some results reported Summer 2015. The HGT-1110 multi-center trial count now includes five countries... Denmark, France, Germany, Australia, and Brazil. Argentina is applied for but not yet recruiting. The inclusion age limit was raised to less than 12 years old at the time of enrollment. A second generation intrathecal port, this one from Sophysa, is now approved for use for new patients. This should enhance comfort and address some reliability concerns about the previous Smith Medical port for intrathecal ERT in infants. The Tübingen clinical trial center is now open bringing the trial center count to three. The Paris clinical trial center is now open providing an alternative to Copenhagen for those enrolled in their HGT-1110 ERT trial. As of June 18, 2012 recruiting has resumed for the HGT-1110 clinical trial. The trial design modification was approved by the EMA to now be 18 patients in 3 groups of differing doses. Trial recruiting had been suspended for 2 1/2 months from April through mid-June while Shire worked with the EMA (European Medical Authority) to remove the no treatment (placebo) arm of the trial. Shire HGT is currently recruiting for a Phase I/II Clinical Trial to study their HGT-1110 intrathecal Enzyme Replacement Therapy. 18 late-infantile patients will be studied for 40 weeks each to determine safety and target dosage. The following Clinical Trial summary was prepared by the MLD Foundation. This page is continually updated and the content is copy-written - please copy the paragraph above and link to this page when sharing this information. Study Summary – Every other week intrathecal injections for 38 weeks via an intrathecal drug delivery device (IDDD) or port implanted in the patient's abdomen. Cohorts – The study will be performed with 18 patients divided into three cohorts of six patients each at increasing dosages of HGT-1110; 10, 30 & 100 mg at each infusion. Enzyme – Recombinant human arylsulfatase A, which is expected to work in the same way as normal human arylsulfatase using a method known as 'recombinant DNA technology': it is made by human cells that have received a gene (DNA) that makes them able to produce arylsulfatase A. Inclusion criteria – includes being ambulatory at the time of screening for admission into the trial, first symptoms before 30 months of age, and under the age of 12. Exclusion criteria includes participation in any other ongoing Clinical Trial and any sort of prior transplant. See full inclusion criteria below. Intrathecal – The spinal fluid naturally circulates between the spinal column and the brain 3.7 times per day and it is on the "other side" of the blood brain barrier that is a typical barrier to intravenously delivered enzyme. * This intrathecal therapy delivers the enzyme directly into the spinal fluid. In order to minimize the chances of infection or injury due to repeated spinal puncture, a small port (a little larger than a US dime in diameter) will be implanted in the abdomen just under the skin - usually on the patient's side or front which is connected via a very small catheter to spine and into the CSF. * The Enzyme is injected through the skin into the port and transfers via the catheter (tubing ) to the spinal fluid. * This port is being studied as an integral part of the Clinical Trial. Please note - this is a static bolus device, not a pump. 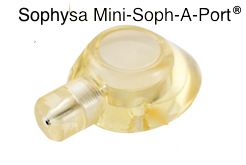 (Image above is the new (December 2013) Sophysa mini Soph-A-Port®. The previous Smiths Medical port can be seen here). Multi-Site – the trial has been approved by the EMA and will accessible to those living in Europe at several European sites. It will not, to the the best of our knowledge, be accessible in United States as it does not have FDA approval. Denmark, Copenhagen is the first site. We will list others as they are confirmed to us. 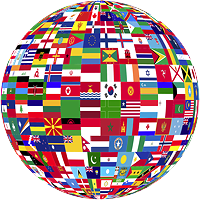 [As of December 2013, centers are open in Denmark, Germany, France, Australia, and Brazil, with Argentina pending]. Continuation of Enzyme Access After the Primary Study Period – We are seeking a Shire confirmation that trial participants will be continued on the ERT until all patients in all three cohorts have completed the primary trial period, and throughout the study of the trial results. Compassionate Use/Named Access – to the best of our knowledge no Compassionate Use or Named Access to HGT-1110 will be made for non-trial participants. Phase I/II Trial Time Frame – Shire estimates the recruiting and study period to be 2 years ending in December 2013, we anticipate they will have difficulty recruiting patients to their criteria and do not expect completion of this trial until at least 2014. Overall HGT-1110 Development Time line – A Phase II/III Clinical Trial will follow the current trial to establish efficacy at the dosage determined optimal by the current trial. It is unlikely product will approved by the regulatory agencies and be generally available, assuming good clinical trial results and best case executions, until 2015 or 2016, or perhaps longer. Why is the Trial Targeted for Late Infantile MLD? – The current Phase I/II Clinical Trial is targeted at the late-infantile from of the disease because this form of the disease is the most rapidly progressing and hence it is easier and faster to show the efficacy of the enzyme therapy. Access for Juveniles, Adults, and Those Already Advanced in the Disease – It is Shire's intention, after drug approval, to make the ERT available to patients with all forms and stages of MLD (as medically viable) including late-infantile, juvenile, and adult forms. Please note, your treating doctor (not Shire) may determine that your loved one is too advanced to see any benefit from the therapy. Participating in the Trial – Please feel free to contact us for up to date information on the trial and assistance contacting the appropriate Shire and investigative staff to be considered for the Clinical Trial. It is likely that all trial inquiries will need to be made by your doctor. What about US & other Non-European Patients? – The FDA has not approved this clinical trial for trial centers in the United States. The every other week infusions must be performed at a specified trial site. While US patients could potentially participate by moving to a country with a trial site at their expense for the duration of the trial and the extension period, please consider the significance of this burden for a therapy that is yet to be proven efficacious (that's why the trial is underway). Principal Investigator – Christine í Dali, MD of the University Hospital Copenhagen, Rigshospitalet. * Dr. Dali is also a member of the MLD Foundation's Medical and Scientific Advisory Board. Orphan Designation – HGT-1110 has Orphan designation by both the EMA for Europe (EU/3/10/813) and the FDA for the US*. Ambulatory at the time of screening – defined as the ability to stand up alone and walk forward 10 steps with one hand held. Enrolled in another clinical study that involves clinical investigations or use of any investigational product (drug or device) within 30 days prior to enrollment in this study or at any time during the study. Patient is 12 years of age or older. The trial was originally designed with three cohorts of five patients each. Each cohort included a "no treatment" (placebo) arm (2 each in the lower dose cohorts and 1 in the higher dose cohort). After review with the EMA and hearing pointed objections about the placebo arm from the MLD Foundation on behalf of MLD patients, the three cohorts were bumped to six patients each and the "no treatment" arm was removed (June 2012). The upper exclusion age was moved from 8 to 12, a new port was approved, and two non-European trial sites opened (December 2013). Shire HGT was originally known as TKT - Transkaryotic Therapies before it was acquired by Shire PLC to form Shire Human Genetic Therapies (Shire HGT). TKT had developed Replagal, a genetically engineered form of galactosidase A for treatment of Fabry disease when it was acquired. It had three other drugs in various stages of development: DYNEPO for the treatment of kidney disease-related anemia, ELAPRASE/I2S - An enzyme replacement therapy for the treatment of Hunter Syndrome, and GA-GCB -a glucocerebrosidase for the treatment of Gaucher disease. 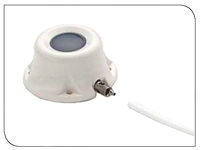 The three ERTs are manufactured through a proprietary process derived from human cell lines, an advanced technology compared to conventional method of using Chinese hamster ovary lines. A Shire overview of TKT from 2005 can be seen here. Shire HGT had a prior intravenous ERT in development. They referred to this product as HGT-1111. It was called Metazyme when it was acquired from Zymenex in April of 2008 as therapy already in Phase I/II clinical trial in Europe. This ERT proved to not be efficacious and further development of this product ceased in February of 2010. More history on the HGT-1111/Metazyme therapy, including clinical trial details and results, can be found here.